From the new wood floors to the multi-tiered chandelier hanging from the vaulted ceiling, the living room is brighter and reflects the owners’ tastes. Photo by Scott Miller. A tulsa couple customized their new home for all the comforts and entertaining. Custom-built walnut cabinetry lends richness to the clean lines of mid-century modern style in the updated kitchen. Old patio doors have been replaced with the nanawall system that opens the home to the outdoor living space and renovated pool. Transitioning from a Country French-style home where they reared their children, a couple of empty nesters decided they were ready for a change of style in a new home suited for entertaining. 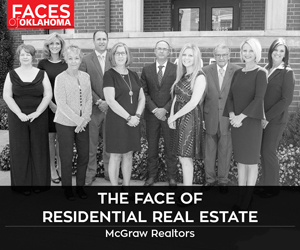 After discovering a 1970s-era home located in the Philbrook Museum area, the Tulsa couple solicited the expertise of husband-and-wife team John and Sherri Duvall, owners of Duvall Architects and Interiors in Tulsa. Tony Jordan, owner of contractors Jordan & Sons, handled the extensive 18-month renovation, although the planning process with the Duvalls began six months earlier. The goal was to create a series of open spaces that flowed seamlessly from one room to the next. And while the overall design is decidedly modern, it was important to the couple to incorporate treasured family antiques into the planning. The living room is a perfect example of the collaborative success between the Duvalls and the homeowners’ interior designer, Doug Deckard. The existing vaulted ceiling was accented with a custom multi-tiered light fixture, and the clean lines of the white upholstered pieces have been juxtaposed with existing antiques. New wood floors with a glazed finish were added throughout the house. The kitchen showcases one of the most dramatic changes. Not only was the small, dark space completely gutted, a wall was removed, blending the kitchen, eating area and den into a great room that’s both airy and bright. 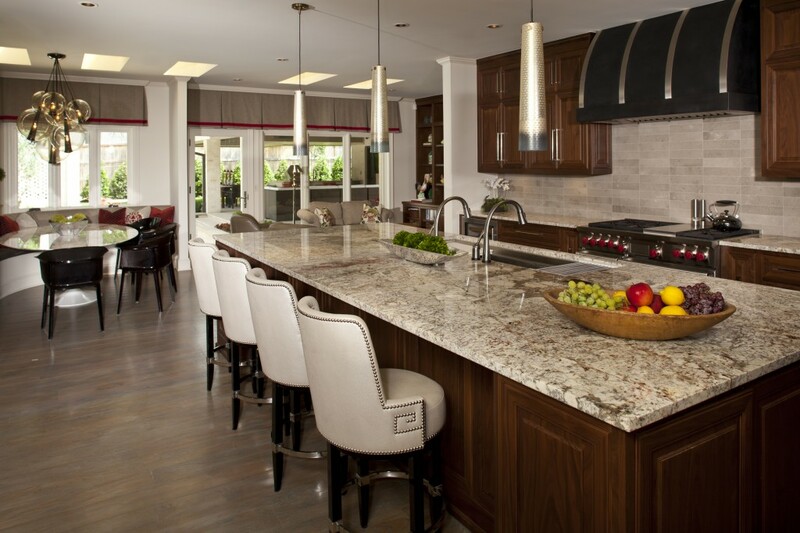 “She (the homeowner) likes to cook, and the couple enjoys entertaining,” says Sherri Duvall. Nearby, a casual eating space was created with a curved, built-in seating area accented by a classic Mid-century oval Saarinen table by Knoll. The striking multiglobe light fixture is from Arteriors. The valance hides solar sunshades, controlled remotely. An eight-foot diameter mahogany inlay table captures attention in the dining room. Inherited antique chairs from the 1800s are casually blended with richly upholstered Parsons chairs. The three-foot diameter blown art glass light fixture is by famed Italian artist Paolo Venini and was purchased from an antiques dealer in New York. It sparkles against a quartzite wall covering on the ceiling and the platinum leaf adorning the dining room walls. In what had been a fourth bedroom, architect John Duvall created a “his” master closet and bathroom as well as a library. 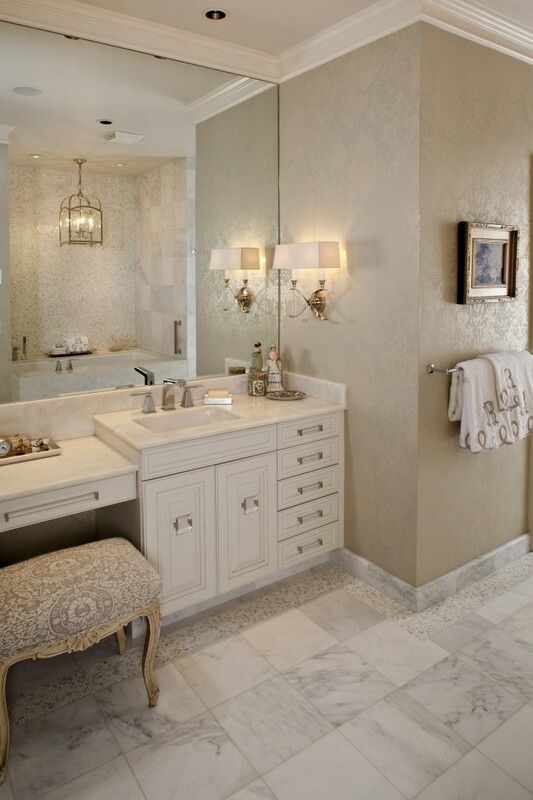 The original master bathroom was gutted and renovated for “her” with countertops of Sea Pearl marble and Carrara Blanco tile for the flooring. The original master closet was also renovated and detailed by Sherri Duvall. The chandelier from the couple’s previous home was brought into the new. 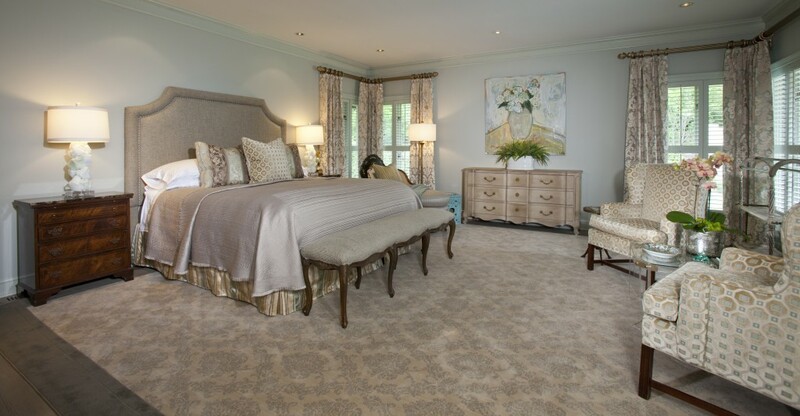 A combination of existing and new furnishings creates the soft and relaxing feel of the couple’s master bedroom. The area rug is custom made, and the milk glass Mid-century lamps were discovered in Dallas. A set of patio doors was replaced by the expansive Nanawall system, creating an extension of the house to an outdoor living area. 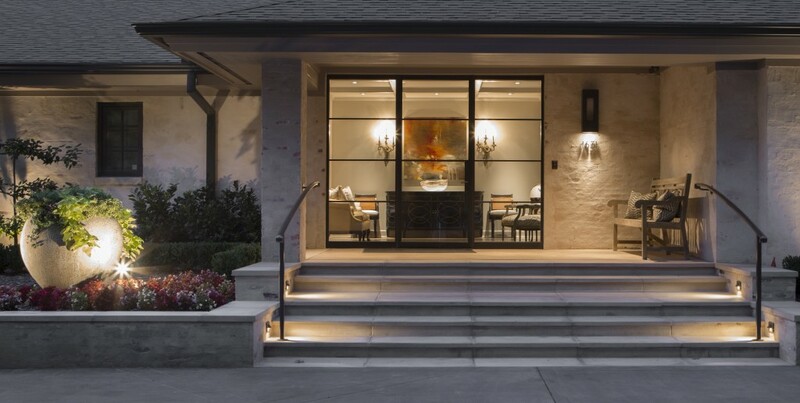 John Pitezel, owner of JP Construction, renovated the existing swimming pool and also added a spa, while Clare Ashby, ASLA, created the landscape design.